Ensign audio output transformer. PC mount. 10 watt. 10 tap input with DCR's ranging from 200 to 700 ohm. We do NOT know the corresponding impedances. 8 ohm output leads with spade terminals. 1-9/16" x 1-7/8" x 1-1/4"H.
NOTE: This is a protected component and a specific drawing is not available. Stancor output transformer. 300 mw. Dual section audio transformer. Rounded corners, aluminum cover. Made in 1968. NSN: 5950-645-3266. Ferrite cored 470 µH: 470 µH PC mount audio transformer. ADC 25 watt audio transformer. Electrostatically shielded. Hermetically sealed. Harris P/N: 478-0239-000. • 600 ohm c.t. : 600 ohm c.t. • 600 ohm c.t. : 150 ohm c.t. • 150 ohm c.t. : 150 ohm c.t. Great Electrical Corporation input transformer. 18 ohm DC Resistance to 24 ohm DC Resistance. Not exactly sure what the impedance is of this little jewel. It is excess from a 1980's era manufacturer. 5/8"L x 9/16"W x 9/16"H. Made in Taiwan. Hard to find antique Hollywood Transformer "Hollytran." 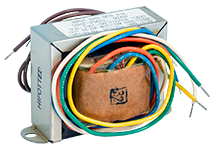 Interstage transformer for vacuum tube amplifiers. Octal plug base. All have dual independent windings on the same core. See (CNE) 11P-JACK for mating connector. 2" x 2-3/4" x 3"H. Made in 1950's. 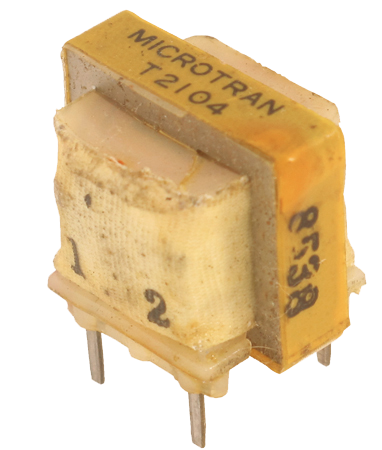 Microtran® audio transformer. 600 ohm C.T. : 600 ohm C.T., 10 madc, 22 dB, 200 Hz - 15 KHz. 1.18" x 0.813" x 0.468". NSN: 5930-00-905-4103. Vintage input impedance matching transformer. Used primarily in RTS/Telex intercom matching networks. 600 ohms output Z. 3/4" x 5/8" x 5/8"H. Sold in matched pairs only. Tamura-Microtran audio coupling transformer. FCC68 coupling. Four pin, no center tap. Model # TTC-110. Foster audio output transformer. 50 Hz - 20 KHz. 66.6 watts.